When it comes to your home and the need to find a West Point Tree Removal Company, you have definitely come to the right place. For greater than three decades now, the C.S. Flournoy team has been the one to trust in for all of your service needs. Although our focus when we first started was on stump grinding, we then became a full service tree care provider. That means we are able to offer just about anything you might need for the caring and well being of your trees, even if that sometimes means removal. This also means our team has the very best in training and hands on experience, which not many other companies in the area can truly offer. Plus, you get the finest in workmanship and customer service all at a more than affordable price. So when it comes to taking care of your home, property and, more specifically, your tree care, only the best should do. At C.S. Flournoy we just happen to be the best, as any of our satisfied customers will tell you. So call on our Tree Removal Company today so we can take care of whatever it is you need done in West Point, VA. 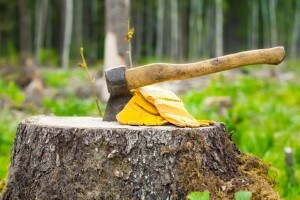 If tree removal service is what you really need you must chose wisely and carefully. Not just any company has the necessary experience and equipment to get the job done. So then you are left with someone you are paying and realize they are in way over their heads. That is the last thing you need to deal with. So go for the name that locals already rely on and trust in. At C.S. Flournoy we take this line of work seriously and it shows in the results we leave behind. Let our West Point Tree Removal experts show you in person how we earned the impeccable reputation we have by offering the finest in craftsmanship and customer service. You will be glad you went with the smart choice the majority of other West Point residents do. If you want honesty and upfront pricing from a tree removal contractor, then go with the pros at C.S. Flournoy. You'll find our prices to be very competitive and our techs to be fair. Don't delay, if you want that stump out of your yard, then have it ground up. You don't have to keep stumps in your yard any longer. We can remove them permanently by having them ground up. We get rid of everything so that you don't have to worry about it any longer. Call our West Point Stump Grinding today for our services. We are honored to have earned the positive reputation we have but it has taken a lot of hard work. Yet, that's really just doing what we do each and every day anyway. But it is nice to get recognition for it. So what can our West Point Tree Trimming professionals take care of for you today? Taking care of your West Point tree trimming and tree removal needs doesn't have to be a challenge. Now that you know the name to trust, all you have to do is sit back and let us take care of the hard work. "I would not hesitate to recommend your company to anyone I know. You've always given me the highest quality of service and have kindly scheduled me as soon as possible, even earlier than expected this time. I wouldn't even consider calling anyone else. Thank You!" If you are looking for a West Point Tree Removal Company then please call 804-264-1000 or complete our online request form.